May 28 was an absolutely amazing storm chase day. I was chasing in a large group including Robert Balogh, Scott McPartland, Dave Lewison, Chris Kridler, Dayna Vettese, Brad Rousseau and Greg Stephens and the TWN weather crew of Mark Robinson and Jaclyn Whittal. We started in Hays, Kansas unsure of the target area. Potential targets included northeastern Colorado, southwestern Kansas and eastern Kansas. The Texas panhandle was another possibility but too far. Although there was significant instability, upper level winds were fairly weak. Eventually, we drifted east and then south to Great Bend to keep both Kansas areas in play. We noticed clearing of the cumulus to the west. Better moisture was eastward. We went northeast on 156 through Ellsworth at 3:33 PM, then east on 140 through Salina, Kansas. The cumulus appeared agitated. Initially, we were following a developing storm just east of Salina, but it died as soon as we reached it. Meanwhile, a larger storm suddenly exploded on the edge of Salina and moved slowly northward. We stopped briefly at 4:28 (1800 Ave & Barn Road) to observe it before going north through Solomon. The storm was gradually strengthening. At 4:50, we turned west on 18 toward Bennington. The storm was directly to our west. The road options were limited. There was a wall cloud by 5:24 pm and funnel at 5:30 PM. I don't know if the funnel touched down due to trees but it soon dissipated. We all stopped on a dirt road just east of Bennington to watch the storm. At 5:33 PM, I wanted to get a bit closer, and I turned back west on 18 with Robert. The others stayed behind. Another wall cloud formed and was a bit more prominent. Robert and I passed through Bennington at 5:35 PM. The Bennington tornado sirens were activated. On the west side of town, we pulled over at 5:36 PM with a nice view of the storm. 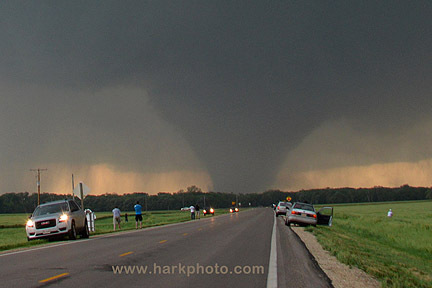 The road was lined with numerous chasers. There was rising scud under the storm. It appeared to be shifting southward. The area of rotation widened and then became directly west of our position. The inflow was increasing by 5:42 PM. Unfortunately, the road did not continue directly to the storm but stopped at a north-south road. The storm structure was beautiful with inflow tail and banding. A tornado formed at 5:45 PM directly to the west. We were parked just east of the town of Bennington. The tornado appeared stationary and was getting bigger. At times, rain would wrap around it. We were ready to blast east at any time since the storm seemed to be moving directly toward us having taken a rightward turn. Looking back, I probably could have gotten much closer since the tornado was more stationary. The tornado was becoming rain-wrapped by 5:55 PM. We shifted eastward a bit, briefly stopping before continuing through town. 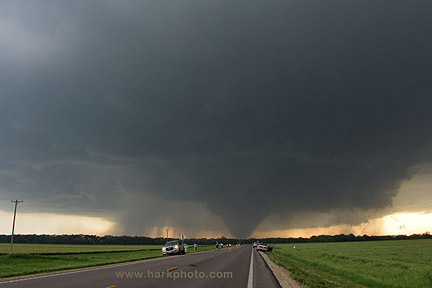 Judging distance was difficult with a rain-wrapped tornado that could be approaching our position. The east escape route went through a town and there was the potential of getting blocked by a railroad crossing. We stopped on the east side of town at 6:06 PM. The tornado was barely visible through the rain. This farther view did give a nice perspective of the whole storm. Since the storm was still fairly stationary, Robert and I drove back west and parked by Scott and Dave on the west side of Bennington at 6:12 PM. The storm was a mass of rain though we could briefly see a faint cone at 6:17 PM. We watched the storm for a while before heading west to investigate some damage. Luckily, the tornado was mainly over open countryside. With decreasing visibility, we ended the chase. We all met for a steak dinner, the traditional post-tornado meal at a restaurant in Salina. We were on the storm from a small towering cumulus through producing a tornado that remained nearly stationary. Unfortunately, thanks to social media, we saw images from chasers who were much closer to the storm or had a better viewing angle. The tornado was mainly stationary instead of shifting eastward or northeastward as expected. This would have allowed a very close approach. At the time, we couldn't judge the distance and didn't want to get too close. Almost always, someone will have better photos or videos. I am very pleased with my chase results. The tornado was rated EF3 based on a damage survey and was up to one mile wide. Per the National Weather Service report, “2 mobile doppler radars were within 5-6km of this tornado and did sample winds around and above 100m well in excess of 166 mph. In fact they measured winds of 247 mph at 100m.” I am happy there were no serious injuries or deaths. 10Z RAP 500 MB 0000Z NWS Tornado Track . .